Paid search ads function as something of an auction system. Advertisers are bidding against each other for the same keywords in real time, so what pops up on your screen when searching at 4.52pm might very well be different from what shows up at 5.18pm. That’s why it is the aggregate view over a course of time that showcases the most relevant results, rather than a “moment-in-time” perspective. This longer term perspective is something you’ll hear us talk about frequently over here at TRFFK. Moreover, because Adwords takes your daily budget and spreads it out across the course of a day, it might be suppressing your ad at the very moment you search because it has just shown it multiple times over the last hour. In other words, it’s pre-programmed to stop your budget running out in the first couple of hours of the day. That’s why it is the aggregate view over a course of time that showcases the most relevant results, rather than a “moment-in-time” perspective. However, it gets more ominous than simply not getting a clear picture of how your campaign is performing. 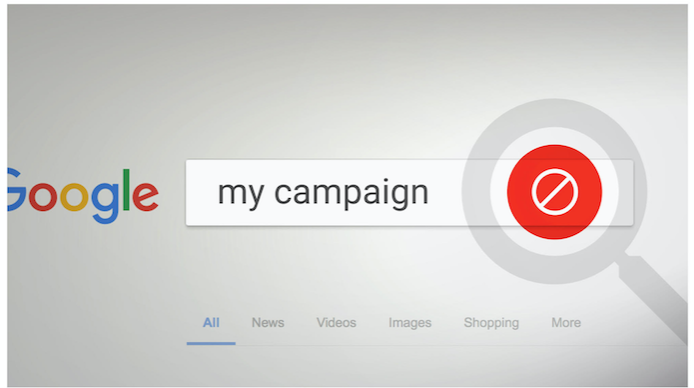 The truth is, you could actually be hurting your campaign by searching your own ad, and effectively increasing your Cost-Per-Click in the long term. Let us explain. When you search for your ad and find it, you obviously don’t want to click on it. That would cost you money. However, by doing this (searching for your ad and then not clicking through on it when it pops up,) you will show up as an impression without a click, which impairs your click through rate and negatively affects your ad rating. The way Google sees it, your ad isn’t relevant. The result? Increased Cost-Per-Click over time. To top it off, the more you search for your ad but don’t click on it, the more likely Google will end up blocking your IP address for it, so that even though your ad is running, it actually isn’t running for you. Frustrating, we know. But there is a solution to scratching that itch of wanting to see your own ads online, and it’s called the AD Preview Tool by Google (http://adwords.google.com/d/AdPreview/). It’s a form of ad simulator that allows you to view your own ads across multiple channels as well as those of your competitors, and the best news is, it won’t impact your campaign one bit! Of course, you could always just ask your team member over here at TRFFK for a full, detailed report of how your campaign is running… The team of experts we have working on your account would be more than happy to send that across. But hey, we know how that keyboard just keeps calling your name, and wanted to make sure you are fully empowered to check in on your campaign the right way.